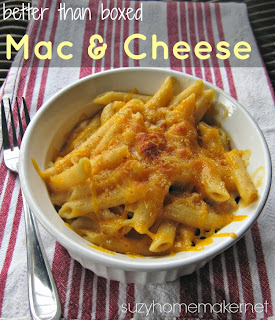 The other day I decided to make some homemade mac and cheese. It was not my intention to compare it to packaged, but I looked at the clock and was wondering how long it would take for me to make it. While water is boiling melt butter, add flour to make a roux (so fancy), grab some spices and add them to the saucepan, start shredding the cheese. As pasta is cooking finish making the sauce. Add some milk to saucepan. Add shredded cheese. Whisk. Check noodles. Noodles are done. Drain noodles in colander. Add back to pot. Finish the cheese sauce and to noodles. ~10 minutes. Total time: ~37 minutes. Where did the extra time come from? I was watching my little one in between cooking. So the extra minutes were those unaccounted for distracted minutes of life with a toddler. Is boxed mac and cheese faster? Yes, but not by much. It is still at least 20 minutes for the same water to boil and the same pasta to cook. In almost the same amount of time you could have a homemade version, with ingredients you choose. I didn't include a recipe because I improvised, but here are a few I like.